This is if you want to pay for your 4 person minimum team. 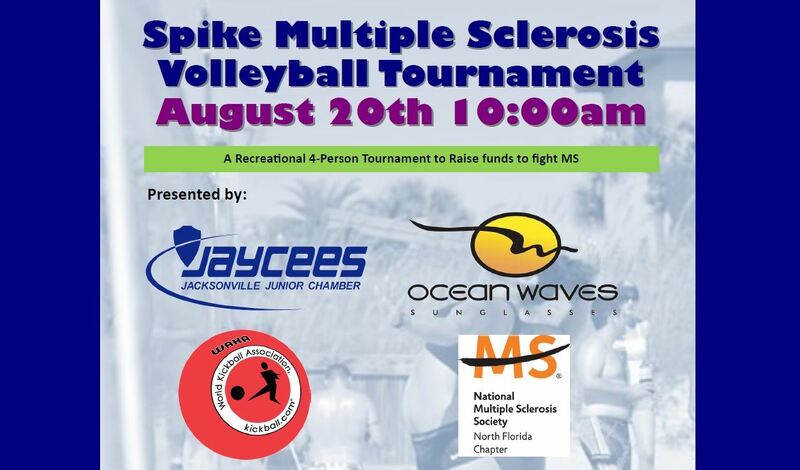 The Jacksonville Jaycees are proud to announce their fourth edition of their popular summer volleyball tournament, this year it is called Spike MS and all proceeds will go to The National Multiple Sclerosis Society, North Florida Chapter. The tournament is a recreational, coed 4 on 4 tournament which will be held August 20th, 2016. It is $25 per player, with a max of six players per team. You can sign up as a team or as a free agent. 1: People have effective treatment choices and solutions to the challenges of living with MS.
2: People affected by MS connect to the individuals, information and resources they need to move their lives forward. So please come out and support a great National and local organization while having some fun in the sun! To registration opens Saturday, July 30th!